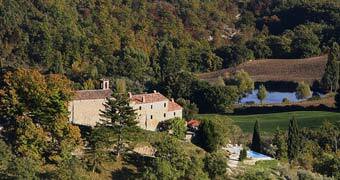 An ancient 17th century monastery transformed into luxury resort: Gubbio's Park Hotel ai Cappuccini. In the countryside just outside Gubbio, the Castello di Petroia offers guests the chance to experience an atmosphere of centuries past. 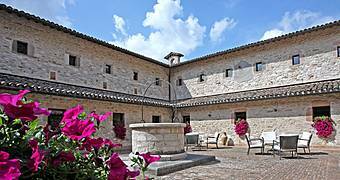 Borgo di Carpiano is a tiny medieval hamlet, hidden amidst the woods in the countryside just outside the Umbrian city of Gubbio, only recently transformed in stunning period residence. 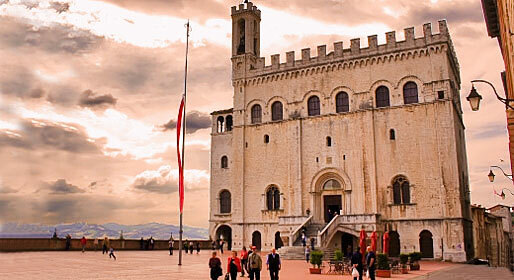 Città di Castello, Assisi, Gubbio and the art of faith. Known for its artistic ceramics, Gualdo Tadino is a picturesque medieval town situated on the hillside of Sant Angelo: panoramic location from where its gazes out over a varied and particularly fertile landscape. The Flea Castle sits right on the summit of the hill. 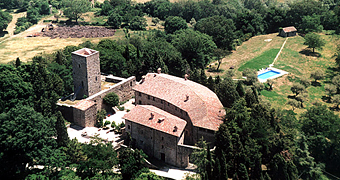 The ancient stronghold, rebuilt by Frederick II in the 13th century, provides the stunning venue for both Gauldo Tadino's Art Gallery and the town's Ceramics Museum. 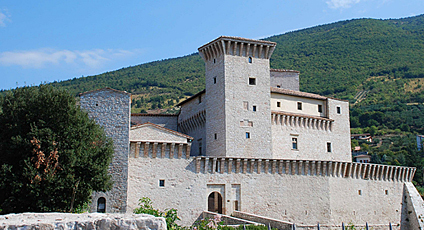 In common with other historic Umbrian towns, Gualdo Tadino is home not only to prestigious palazzi such as the Palazzo Comunale and Palazzo del Podestà (of which only the Civic Tower remains), but also to a series of magnificent churches. Among the houses of worship particularly worthy of interest we find the 13th century Duomo of San Benedetto, featuring a Romanesque-gothic façade adorned with imposing portals and a beautiful rose window, and the Church of San Francesco, a splendid edifice first constructed in the 14th century and subsequently reworked until reaching its present gothic appearance, decorated by the painter Matteo di Gualdo. Other works by the eminent local artist can be admired in the Church of Santa Maria dei Raccomandati, seat of the confraternity of the same name. Just a few kilometers separate Gualdo from the Conca di Valsorda prairies which, situated at an elevation of some thousand meters, offer breathtaking views over the surrounding countryside and two tiny mountain lakes.